A victim of the Brutalist style of architecture, City Hall is one of the ugliest buildings in a city full of history and some lovely architecture. Though a close up shot like this does make it look better than it actually is. Click the following link for a picture I posted two years ago and you can judge for yourself if you think it is ugly too. Fantastic lines and patterns in this! Sometimes the ugly buildings provide the best photos! It's hard to imagine anyone thinking that looks good. It reminds me of government buildings from 1950s Soviet Union. The long view from your older post looks like a model because it is in a narrow area of focus. But I don't think it is really a narrow depth of field, it looks more like the upper and lower areas were blurred with some sort of photo tool. Am I right? I totally agree with T. Becque. I think Boston has lovely buildings with classic, charming architecture.This one is so "modern"for my eyes.I think I would prefer the traditional ones. I like the lines and patterns in this photo, emphasized by your use of black and white. But, man, it looks massive! As far as the overall building, I agree with you---based on the historical architecture of the city. But the lines are eye-catching, that's for sure. Brutal and heavy architecture shot, like those strong lines and the shadow makes everything look more threatening. Ha! "Brutalist" style. I like that! (You were joking, right?) I agree, there are some masses of concrete that seem to have no redeeming factors at all! It doesn't exactly fit with the rest of your lovely city. We have some stuff from about the same era - thankfully some of it is being pulled down nowadays. But your close-up at least has interesting patterns. 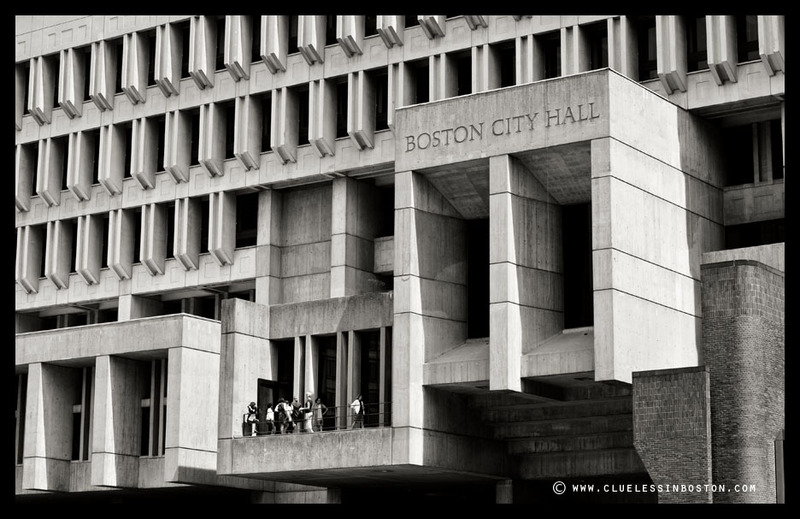 I worked in Boston City Hall when it was new in the late 1960s. The logic was that the lower floors are open, to greet people as they come to pay bills or talk to service providers. The middle (which is featured in your photo) is complex, because that is where the city council and mayor are located. The top is even and regular, because that is where the anonymous pencil-pushers work. Most people hate it, and I hate most from that period, but I do have some feeling for BCH. Jack's explanation made me look at it with a second glance. Very interesting. I don't find the part you show in your photo too bad ... the photo makes an interesting geometrical pattern out of this building ... I wonder what I might think about the rest of the building, though. I think the ideas are interesting but the commitment to concrete was not a wise choice. Concrete buildings only ever seem to look like older versions of themselves- they do not acquire "quaintness" as time goes by.